At an impassioned four-hour public hearing held yesterday (29 May) by the New York Landmarks Preservation Commission (LPC), around 50 members of the public, as well as Selldorf, the Frick’s director Ian Wardropper and members of the commission debated the proposed $160m Annabelle Selldorf Architects-designed expansion and renovation of the Frick Collection in New York. The LPC remains undecided on the project, which is due to break ground in 2020, and will hold another meeting to discuss and vote on it later this year. “The institution has long lacked basic functions,” Wardropper said at the beginning of the hearing. This is the fourth expansion proposal for the institution in the past 20 years, and Wadropper pointed to issues like a lack of dedicated education spaces making lectures—and even hanging students’ coats—a challenge. “There is a real disparity between what you see in the galleries, and the struggle behind the scenes,” he added. The director emphasised that the overhaul does not aim to bump attendance, currently around 300,000 visitors per year, but to make the museum function better and to be more accessible, for instance, by adding a new ramp for disabled visitors at the 70th Street entrance. She acknowledged the concerns over the 70th Street viewing garden, designed by Russell Page in 1977, which would have been destroyed in a 2014 building proposal—a central reason it was ultimately rejected in June 2015. “I share that delight in the garden,” Selldorf said. “We take our responsibility to restore and rebuild the garden very seriously.” The project would require the garden’s North wall, pool and sculptures to be dismantled and reconstructed in order to turn the underground space beneath the garden, currently a four-storey art vault, into a 220-seat auditorium. 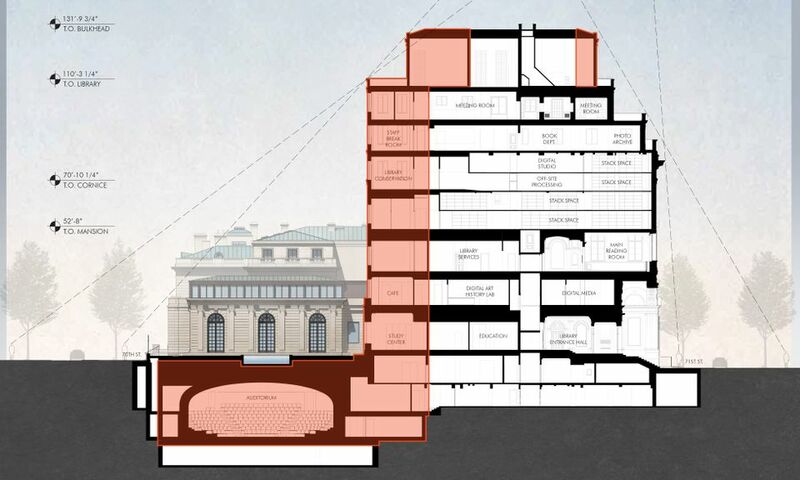 While the design has been commended for sparing the garden, a seven-storey extension on its library building (matching the existing height) for a study centre, staff spaces, a café and conservation spaces will take over the interstitial space between the library and the North garden wall, and in the current design, do away with the trompe l’oeil device of tree plantings on the North wall (intended to give the illusion of a yard beyond). This was frequently brought up during the hearing in objections to the project. Selldorf said after the public speakers that she and her team are “thoroughly researching” solutions to add plantings to the current design to replicate this, ideally with pear trees as intended by Page, although she “cannot be 100% sure” that this will be incorporated. Many of the strongest criticisms throughout the hearing, particularly on this multi-storey library extension, came from local residents, although the neighbourhood speakers overall seemed split on the project. Some even tartly questioned whether staff needed spaces overlooking Central Park, located across Fifth Avenue from the Frick. The architecture and art communities, meanwhile, expressed broad support. Thelma Golden, the director and chief curator of the Studio Museum in Harlem, Lisa Phillips, the director of the New Museum and Rebecca Robertson, the president and executive producer of the Park Avenue Armory, all wrote letters strongly in favour of the project, which were read at the meeting. 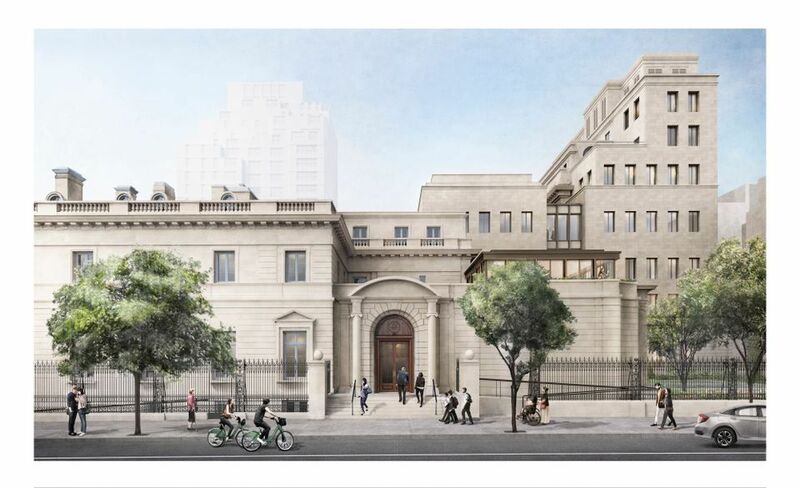 Descendants of Henry Clay Frick also spoke: Frick’s great-granddaughter Martha Frick Symington Sanger, who firmly opposes the project, and his great-grandson and Frick Collection board member Peter Blanchard III, who gave it his enthusiastic support. Elizabeth Mugar Eveillard, the chair of the Frick's board, also read a letter in support of the project signed by four members of the Frick family (including Blanchard). Wardropper later addressed many speakers’ comments and suggestions, including the possibility of buying an adjacent property for sale, which “wouldn’t even begin to solve [the Frick’s] problems”, he said, and which the museum has already unsuccessfully bid on twice. In addition, only the basement and first floor are on the market, and he said it is “unlikely” that the building’s five other owners would sell to the Frick. He also rejected the idea of moving staff offsite, a situation for “very few museums in the city”, and which “generally doesn’t work”. Selldorf, meanwhile, said that the concept of using more underground space, suggested multiple times, was untenable.